Pink cascades of flowers dangle from the nearly-bare branches of a tall shrub. This is red flowering currant, or Ribes sanguineum, an early bloomer that usually blossoms from January on throughout the spring. 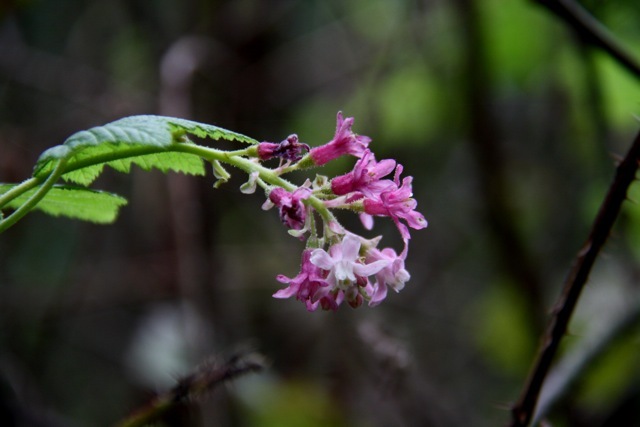 Up to 20 small flowers unfurl from each raceme, varying shades of pink near the end of each branch where last year’s brown twig has given rise to a new shoot of green. The blue-black berries of this shrub are edible but not particularly tasty.